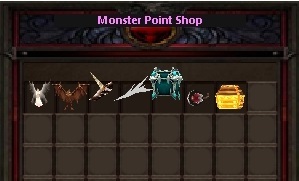 Monster Points can be used to buy exclusive items. To do this, press D on your keyboard in any Towns in game and click Monster Points Shop. You will see items in there that you can only buy using Monster Points. Box Of Secrets 2500 Drop to get a random Black Edition Set Non-FO Equipment Part. Cornucopia 500 Drop to get any of these in random: Jewel of Ancient, Jewel of Excellent, Jewel of Luck, Jewel of Skill, Jewel of Ancient Harmony and Jewel of Extraction. This page was last edited on 7 April 2019, at 13:51.